A dark night fell on a young couple from our church on Monday. They lost their infant baby girl only 5 days from the delivery date. I was called to the hospital and spent a couple of hours there with this couple and some family members. They asked for me because they knew my wife and I had a similar experience years ago. Our son would be 24 this year in October. Going to that hospital room and feeling the heaviness of that loss brought back so many memories. I am gathering up the strength to do the funeral on Friday, but even through the fragility of it all, I am still confident in the hope of the resurrection which is rooted in the reality of Christ’s resurrection on a Sunday morning outside of Jerusalem. Some time ago I read an article about a 30 year old Harvard Chaplain, Greg Epstein, who is an avowed atheist and an up and coming humanist voice in this world of confused allegiances. Though he is not by any stretch a unanimity among humanists (as he prefers to refer to himself), he is certainly generating a lot of buzz on the blogsphere. What caught my attention more than anything in this article, though, was the reporter’s description of funerals without God, which Epstein conducts for those who do not believe. Who would have thought, a man who dares offer comfort in the face of death without a theological framework! This article made me think of a chapter in Ravi Zacharias’ Can Man Live Without God? There is a section there titled “Where is Antitheism When it Hurts?” A passage in that section is particularly disturbing. It describes a funeral in which one person in the audience felt utterly disappointed and let down because instead of offering any kind of hope the priest made a political statement about how we need to dedicate more funding to fight certain kinds of diseases, etc. The thought of conducting a funeral without God is so preposterous to me that I dared to do something I had never done before — I wrote an atheistic sermon! Before you read on and perhaps think unkind thoughts about my audacity, please, consider this: I’ve yet to see any atheist or agnostic organization flock to a campus, such as Virginia Tech last year, on the aftermath of the terrible shootings that happened there, and offer real hope to a community in search of meaning and solace. Now I am not saying this has never been tried before. I am questioning whether it really works. I am saying that when tragedy hits us and our dark hour threatens to engulf us, it is those who have a connection with God, or are perceived to have a connection with God, that are sought after. So at the risk of exposing my insanity, I offer atheists a script of what a funeral sermon without God should look like. Obviously, Epstein is not asking for one and his would no doubt be more eloquent than mine. But would it be more truthful? I am talking about a sermon that would tell it the way it is, no sugar coating, no empty talk; the is the equivalent of what people in my circles call a “come to Jesus talk,” only in this case it would be more like a “come to nothing” talk. “I want to thank you for coming this morning. I know we are all overwhelmed and saddened by the sudden death of our beloved Jane. And I know you all came to her funeral because you wanted to honor her memory. But I would be foolish if I didn’t think you also came here in search of some answers. After all, she has just been removed from us. Yesterday she was here, today we are here but she isn’t. Tomorrow we ourselves might be gone. There is some persistent finality in this and we all struggle to make sense of it all. The only thing I can say for certain is that Jane is no longer suffering. As we all know, her last days here on earth were of intense suffering. Well, now we should take consolation in the fact that she is no longer in pain. It’s all gone now. Of course, she is gone too and that’s why we should all get mad at a god – if there were only – who permits such dreaded diseases to run rampant in this word. And for all of you who might believe something different, I invite you to look at Jane’s body. You look at her and the same beautiful face, the shy smile, the mischievous look, are still there, but we all know Jane is not there. There is no evidence that she went anywhere and all of those who went before her and all of us who will one day follow her – no one has ever come back to tell the story. At least no one that we can irrefutably say was dead has come back. I know there are writings about a dead Nazarene carpenter who was supposedly buried for three days and came back to life. But these, along with other ancient stories, are myths our modern minds, enlightened by science, cannot accept as facts. If you, however, insist on believing such things, I respect you, but I would have to keep my children away from you in fear that your fancy ideas might poison their little brains. Nothing personal, though. Lest you think that I am only a secular version of a prophet of doom, I would like to say that though we don’t have ultimate answers to the problem of death and we are fairly certain that life as we know it is a product of natural selection, randomly but determinedly working to make us who we are; though we may not know exactly what our purpose here on earth is, and I am reasonably sure that there is nothing unique about this planet we call “earth,” or the humans who live here, in spite of all of this, there is still a multitude of things we can do to honor Jane’s life with all the creative powers that are within each one of us. You can go home and hug your children and promise them you will always be there for them, no matter what. We already heard that Jane was such a dedicated mother to her young children and though I can’t say that she is there for them in any physical sense now, there is a sense in which the memory of who she was, her gracious spirit, her generosity, her tireless work for people who were disadvantaged, all of these things will remain with us as long as we live. I know this will be a great source of comfort to her children and to all of us who are, were, her friends. I have asked the ushers to hand each of us a freshly cut beautiful white rose from Ecuador. I hope you will take one as you leave this morning. They were Jane’s favorite flowers and their wonderful, exuberant scent reminds us of the new season of Spring which this day is just announcing. It speaks of new beginnings, which death always sort of signifies — at least for the ones who remain living. Please, take the flower home with you and care for it for the next few days. I know that just like our life, the flower is going to eventually wither and die. But while you have it, enjoy it, smell it, feed it, and tenderly handle it. We have even included a small flyer explaining how you can make your flower last longer. May this rose be a reminder to all of us that there is still a lot of work to be done, in order to make this world a better place. May we not falter, even if we know we only have a window of time to achieve our goal. There it is. You feel reassured yet? Let me simply say this: I am just glad I will never have to preach it. Better yet: I am delighted I don’t NEED to ever preach it. Reverend humanist Epstein: try this one at Virginia Tech or at the West Nickel Mines School in Pennsylvania. “I am the resurrection and the life. Anyone who believes in me will live, even after dying. 26 Everyone who lives in me and believes in me will never ever die.” (Jesus Christ). Joachin Phoenix is back in the news. The last time I saw him he was stumbling through an interview on the set of the David Letterman show. 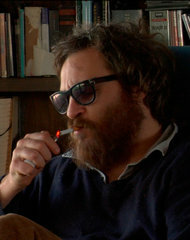 He looked disoriented, to say the least, to the delight of his host, who sometimes looks for the comic in the tragic. At the end of the interview, with the crowd laughing audibly, Mr. Letterman quipped that they would have to issue an apology to Farrah Fawcett (for her equally confused appearance on his show in 1997). Anyway, at that time he was trying to tell David Letterman that he was done with acting. He was now working on becoming a rapper. Well, two years later and still no rapping hit to his name, he is back on the big screen portraying “Freddie” in the movie “The Master,” directed by Paul Thomas Anderson. I have not seen the movie nor do I know if I will see it. But from the reviews I have read, it looks like people will soon forget Mr. Phoenix’s performance on the David Letterman show (and even his more bizarre appearance on the “documentary” “I am still here) and will start talking about potentially another Academy nomination for his performance, which is supposed to be brilliant in this movie, which opens this Friday. There is a part of me that is happy for Mr. Phoenix. He is certainly a multi-talented actor, deep and little nuanced in his interpretations. He is all in and can be raw talent at times. Everyone seems to agree that he’s got what it takes, so it seems reasonable to assume that he will probably continue to to make great movies. And that is the part that makes me happy. But there is also something about him that still scares me. In fact, the director of “The Master” may have said it best, when he was considering him for the part of “Freddie.” He said, “Joachin scares me, in a good way.” Well, I don’t know if the latter part of that statement reflects my sentiment. He just plain scares me… in a serious way. I still remember Mr. Phoenix as largely living on the edge. Maybe he walks a fine line between sanity and insanity. But some people would say that is true of all of us, to a certain extent. Or maybe he is still so grief-stricken by the tragic death of his older brother River, also an accomplished actor and musician, who died of an overdose of cocaine and heroine in the early morning hours of October 21, 1993. Joachin, his sister Rain, and some other family and friends were present when River collapsed on the sidewalk of a hotel in California. They attempted to revive him, to no avail. How can you possibly forget the pain of such a sudden departure? Mr. Phoenix seems to be a classic representative of a group of young artists whose life early on has been marked by tragedy, addiction, and neglect so deep that it threatens to swallow them up at any moment. They live in a parallel universe, so it seems, between total brilliance and total dejection. At one moment creating prolifically; at another destroying furiously, their art being the only thing that gives them a sense of worth. So it is no wonder that Joachin wanted to leave the milieu that so prematurely harvested his brother’s life. It is no surprise he may have wanted a clean break. But now he is back at it and deeply in it. Can he survive the rush of attention again and find enduring solace for his soul? The are, I believe, some holes in the heart that cannot be completely filled, even with the adulation of the media and fans the world over. There are pains that require so much soul-searching and divine intervention that it would be doubtful (though not impossible) that anyone embracing and breathing the fast pace Hollywood lane can attain. There are things neither evolution nor theism can explain. 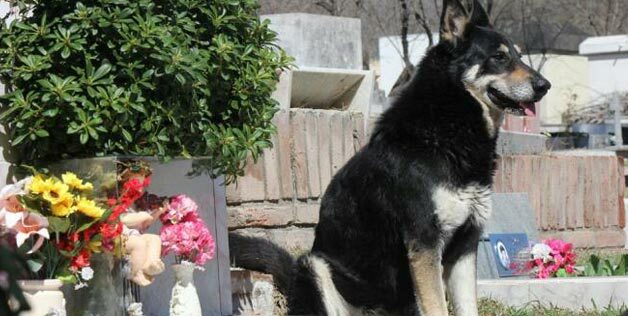 In Argentina a dog named “Capitán” has been sleeping on his former owner’s grave for the last six years. Every night, according to the caretaker of the cemetery, at 6:00 pm sharp, the dog assumes its post and stays there all night. No one knows how the dog found the cemetery to begin with since it stayed home on the day of the funeral, but the fact is that after the owner’s passing, the dog found its way through the city of Cordoba until it found the scent identified with the man it once knew. (But didn’t the man already stink, thus emitted a different odor?). Maybe the dog followed the residues of the smell on the clothes of the people who attended the funeral? Or maybe it “talked” to other dogs living nearby? Or maybe the former owner had taken it there on a premonitory trip? Who knows? No matter. The dog disappeared shortly after the funeral and the family thought it had been run over. After one week, when they went back to the cemetery, they found the dog keeping vigil on the grave. When it saw them, it emitted sounds that appeared to be the sounds of wailing. But that is not all. After returning home for a few days, the dog returned to the cemetery for apparently it could not bear the thought of being that far away from the remains of its owner. Now how do you explain that? At the risk of showing my ignorance here, I imagine that evolution would possibly say that it is purely instinctive. But how come other dogs don’t exhibit such signs of loyalty? And what “advantages” for the survival of the species would this behavior bring? Theologians would have nothing to say. After all, for so many of them dogs don’t even have a soul. But how can you be so loyal without a soul? 1. There are some bonds that transcend the grave. I find in this story some indirect evidence that there is something in all beings that is intangible but real — some kind of a “soul connection” that apparently even animals can feel. This should give pause to those who believe that the material is all there is. 2. Dogs have this almost innate ability to know who their owner is. In a home with several people, how do dogs know who their real “papa” is? Is it related to how much love and care they receive or do they simply “pick” someone? And is this knack for branding only innate to animals? I once heard someone say “I am a fool for Jesus, whose fool are you?” Is it true that someone always has our heart or is there someone out there whose lord is only herself? 3. Grief is the deepest, most heartbreaking feeling anyone can ever experience. It’s been with us as long as humans have been around. If a dog can express its sadness over separation from a human, imagine what this sort of tear of the soul can do to a human being… Never underestimate the power of a loss. That is why I personally am happy that for me there is hope beyond the grave. I never knew a dog could teach me lessons, but today I take my hats off to “Oh Captain, my captain,” faithful in life, loyal in death. Long live el “Capitán”! This has been a rough day for me so I am in desperate need of some good news. No, I am not referring to a political speech, even one as masterful as the one delivered by Mr. Clinton, “the communicator,” last night. I need some feel good story. How about three? Let’s start with Luz Milagros, the little girl who at birth was declared dead by her doctors in Argentina, only to be found alive by her parents in the hospital morgue 12 hours later. Today, she is safely home with her four brothers and sisters, to continue her recuperation. But she is in a home that is especially equipped with medical equipment to help her and 24-7 help from doctors. The little girl, who was born at six months and “dead” on arrival, does honor to her name — Luz (“light”) Milagros (“miracles”). Read the story here in Spanish. Give it up to Wyatt Earber, the 8-year-old who set out to win a scavenger hunt in his community with the express purpose of helping 2-year-old Cara Kielty, who lives on his street and was diagnosed with leukemia back in May. He happened to win the $1,000.00 and donated the money to help pay for Cara’s cancer treatment. Read the story here. I wonder what would happen if more parents raised this kind of child? I mean, you have to credit the parents when a child so young turns out so generous. In this and age of dysfunctional families, it is always so inspiring to hear stories of those who are breaking the mold. I want to emulate little Wyatt. 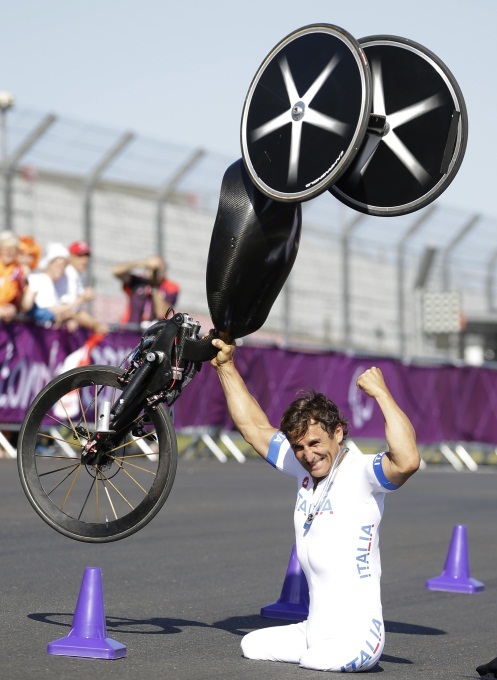 Finally, from the world of sports: Italian ex-F-1 pilot, Alessandro Zanardi, who had a horrific crash during a race in 2001, and as a result had to have both legs amputated and went through a brutal rehab and recuperation period, just reappeared in the world of competitive sports in the last couple of days. He rose to the top again, winning a gold medal in the London Paralympics in the sport of Handbike. Read the story in Portuguese here. 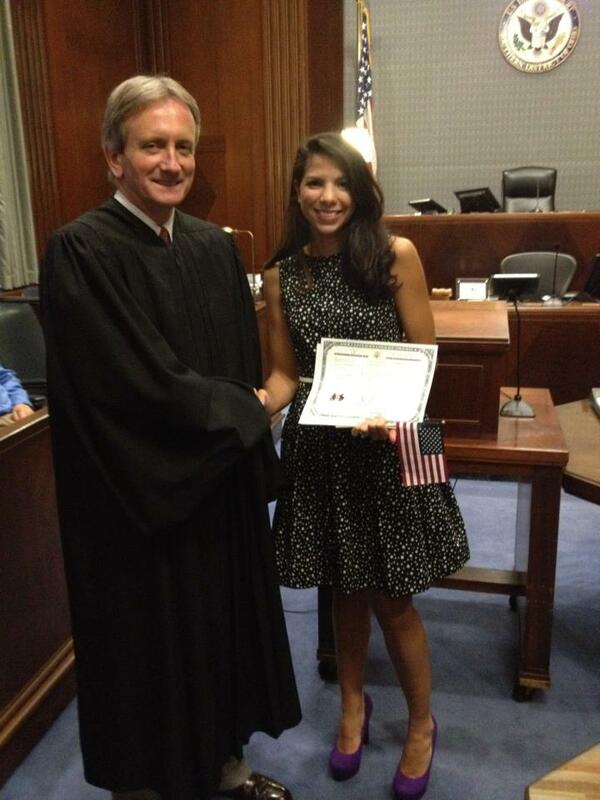 So after almost 19 years in this country, my youngest daughter, Carissa, who was only 6 when we moved to the U.S., became a U.S. citizen today. I saw a picture of a jubilant Carissa, flanked by her husband Paul and the judge presiding over the swearing-in ceremony today in Columbus, Ohio. There were some odd things and surprises during the proceedings. To begin with, the presiding judge just return from a vacation in Brazil. Then, there was the fact that according to my daughter, most of the new U.S. citizens were not able to speak English. Of 50+ people, only about six or seven could speak English fluently and the vast majority were from Somalia. This is surprising since the applicants have to submit themselves to a test about American history and government. I have no idea how they could have passed the test. Maybe they can read better than they can speak English. Another interesting thing was that all the new citizens had to watch a video in which President Obama greeted them. I don’t think he asked for them to vote Democratic, though I suspect the majority will. And the surprise of the day — instead of making the new citizens sing “The Star-Spangled Banner,” they made them sing “I am proud to be an American”! Finally, I was going to attend the ceremony, but in the end, because of my work, I was not able to go. I was sad but when I heard how long it took — three and a half hours from the time she went in — I was sort of glad. The celebration will have to wait. I am very proud of my daughter and her commitment to her adopted country. I am deeply thankful for her accomplishments in a country that was not of her birth. It is a tribute to the beauty of this country where someone can dream big and see his/her dreams come true. I am humbled by the resolve of my daughter to serve people of this great country, especially those who have no voice. I look forward to seeing how God is going to use her to make a huge difference in this world.